UPS overnight orders have a cutoff time of 12:00p.m. eastern pacific time. If not received by that time, they will ship the following business day as an overnight order. UPS has increased their shipping rates over the last 2 years. To try to avoid these high rates, we have included a USPS option for US only up to 2 pounds. Additional weight is usually not cheaper to send thru USPS. If for any reason, you feel your rate is too high, you may request an alternative shipping method in the comment section. USPS does not have tracking available for orders. Please know that when we order online, we do not want to pay high shipping rates and we would not expect you to. We will do everything we can to ship the cheapest way possible. If you see that we have overlooked something, please don't hesitate to contact us. .
foosball.com will contact you via e-mail if there is a delay in shipping or extra freight charges are required for your order. Due to UPS's extremely high rates to you, we will ship your order USPS Mail. This should get your parts to you in approx. 5-7 days. Orders are processed within 72 hours and take approx 7-10 days to receive. Customer will be responsible for any custom clearance fees . We ship USPS Canada to try to avoid these charges for you. We do not ship UPS to Canada. You will be notified of any additional freight charges. We will cover up to an additional $2, more than that we will have to charge your card the additional freight. Also, if there is a unusually high freight charge difference we will issue you a credit to your card. Orders are processed within 72 hours and take approx 2-4 weeks to receive. Customer will be responsible for any custom/duty/fees required by their country. We do not ship UPS to International locations. Shipment comes via USPS International Priority mail with few exceptions based on outrageous shipping fees, in which case you'll get an e-mail from us. We will try to ship the cheapest way possible. We will cover up to an additional $2, more than that will have to be charged to your card.Also, if there is an unusually high freight charge difference we will issue you a credit to your card. 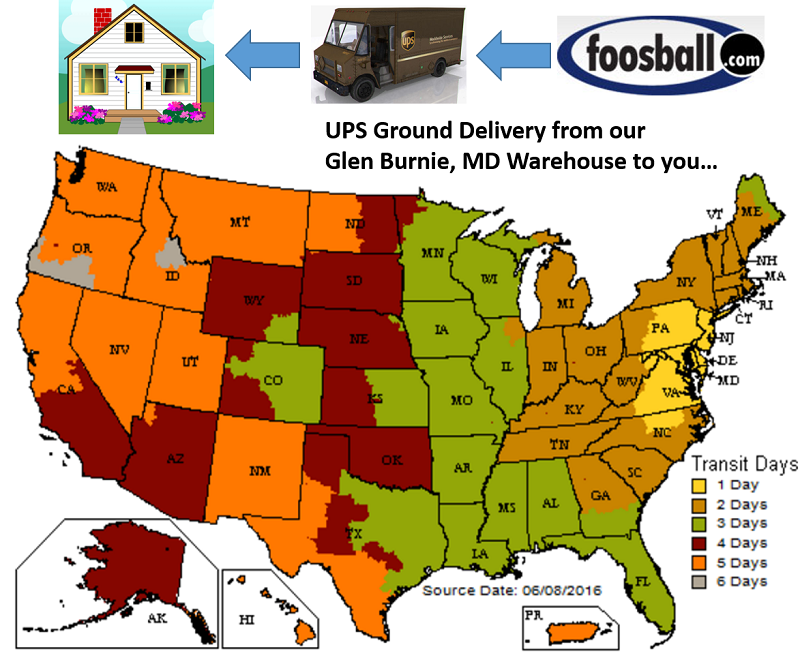 foosball.com will ship your order via Common Carrier (truck) curbside delivery, selecting the best carrier to your destination. :IMPORTANT: Freight companies are required only to deliver to the address specified. Drivers are not required to unload nor handle the shipment. You should be prepared to move the carton(s) from the truck and into whatever room or area you intend to set the table(s) up. We recommend that you have at least one other person available to assist you. Damaged Items: • foosball.com requires all damages to be reported within 3 days. This is for our customers' protection in that freight companies restrict the amount of time within which a freight damage claim can be made. • If your table arrives and has visible damage, please refuse it and call us immediately. We will promptly send you a replacement. • If you have concern about table damage but find no significant damage in the outer carton, please mark the Freight Bill Receipt accordingly. (For example, "box has several dents, torn in corner, etc.") • If, on examination of your table, you find a manufacturing defect, we will do everything necessary to repair your table to original factory specifications or replace it with a new table. • If, upon opening the carton, you find concealed damage, save the boxes and contact foosball.com and we will help you file a freight claim and work with you to get the necessary parts to bring the table to new condition. We may have to invoice you for the parts but will not require payment until you receive payment from the carrier. Order Confirmation: When you place an order, you will receive an order confirmation by email indicating that your order was received. You will be contacted again when your order is ready to ship. Sales Taxes: Applicable sales taxes will be added to all Maryland (6%) orders. If you are a Maryland resident and are remitting with a check or money order, you must compute and add the appropriate sales tax to your total remittance (compute tax ONLY on merchandise, NOT including freight). Return Policy: • If you wish to return your order within 10 days, you must email us to at postsales@foosball.com. Debbie will email you with returning procedures. • Return shipping charges and arrangements are the responsibility of the customer. We cannot credit initial or return shipping charges. • It is our sincere desire to make your shopping experience enjoyable ... and our guiding policy is to protect honest customers and keep our prices low. Yahoo Store Security: • All online transactions at Yahoo! Stores are handled with industry-standard SSL encryption. • When you enter your credit card number into the order form, it is transmitted across the Internet in an encrypted (scrambled) form, then decoded when it gets to us. • For added security, we also encrypt the credit card number when it is stored on disk, and when we forward it to the merchant. "The prevalent opinion...is that on-line credit card use is actually no riskier for consumers than traditional 'low-tech' transactions." • We order products online regularly, both as a company and as individuals. When we use a credit card to buy something online, we feel at least as safe as we would using one in a store or restaurant.